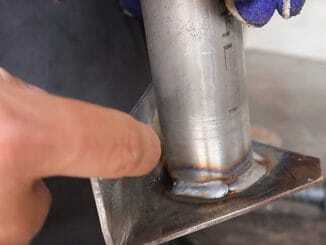 The clearance between the front of your engine and radiator can be very tight. 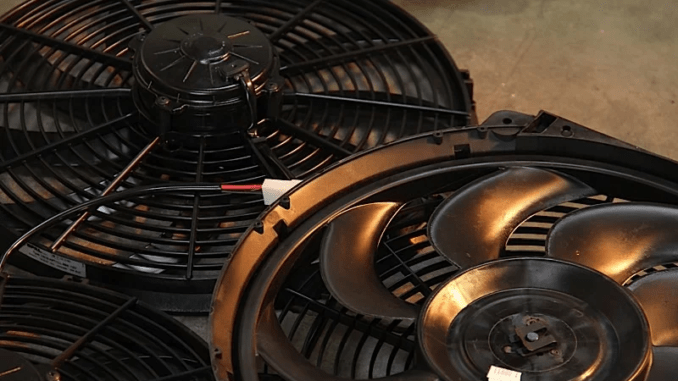 Dual electric fans could be the solution to your cooling issues. Dual electric cooling fans have several benefits over single fans — Dual fans can pull (or push) more CFM between the two fans versus a single fan, and dual fan setups allow for more clearance for front of engine accessories. There are several ways that a dual fan can be wired. For example, dual thermostat switches or dual relays could be used to control each fan separately. Or a single relay could be used to control both fans. 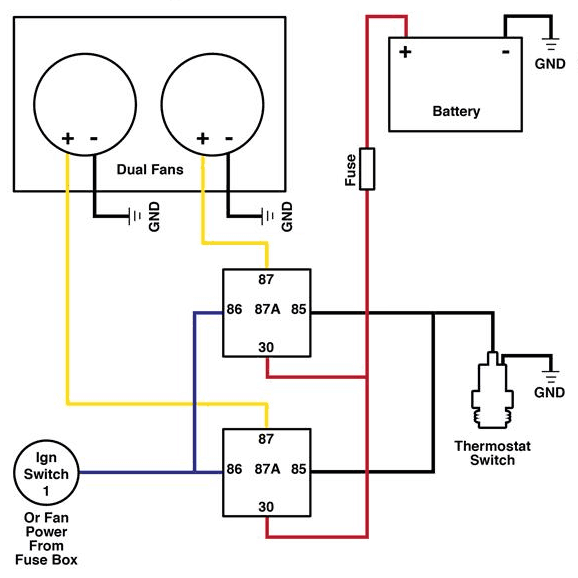 The cooling fan wiring diagram below is what we’ve found to be the simplest and most reliable method. 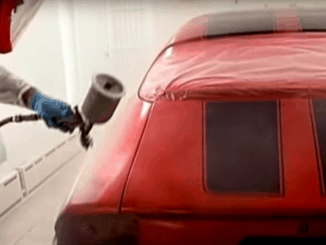 It uses a 40-Amp Electric Relay and Electric Fan Sensor. Start your wiring project by taking both of the positive wires from the fans and run them to the yellow wires on each relay (tab 87). Then connect switched power (usually from your ignition switch), to the blue wires on both relays (tab 86). Next, splice together both black wires from the relays (tab 85) and connect them to the thermostat switch. Finally, run a fused constant power to both of the red wires on the relays (tab 30). 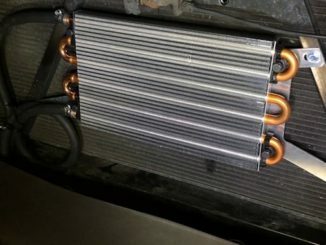 With dual electric cooling fans wired as shown, you can keep your engine cool, and in most cases, not have to worry about clearance issues between the radiator and grill.